If you're thinking "um, that stuffed animal has more than one head" you would be right! It's actually the three headed dog Fluffy from Harry Potter! My dad got it for me a few years back and it's had a place on my bed since. Fun fact, it's actually not the only multi-headed stuffed animal I own. I also have a two-headed cow from a Ripley's museum from when I was younger! But back to the regular decor....I wanted my bedroom to feel absolutely comfortable. That's my number one priority with style coming second. 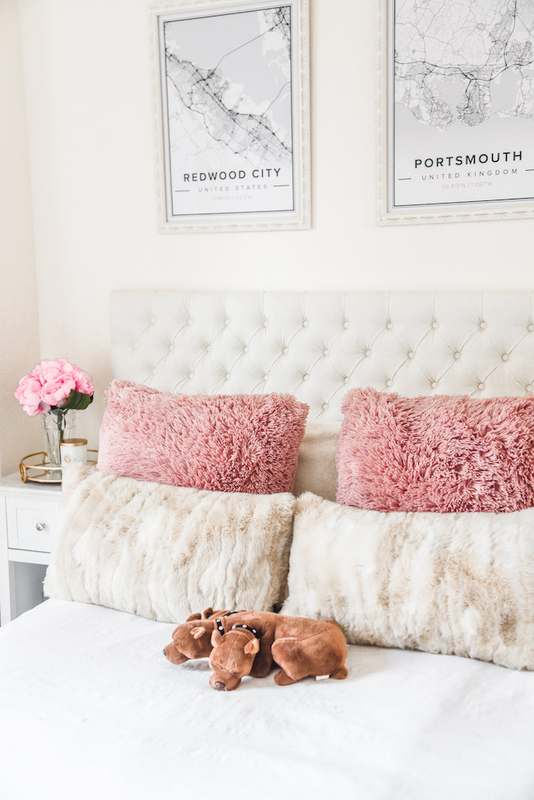 My duvet cover is exceptionally soft, my pillows are extra cushy, and when I step off my bed my feet are greeted either by a nice plush area rug or a super soft faux sheepskin rug. For the style, I knew I didn't want anything too crazy, so I went for a more minimalist/classic route. 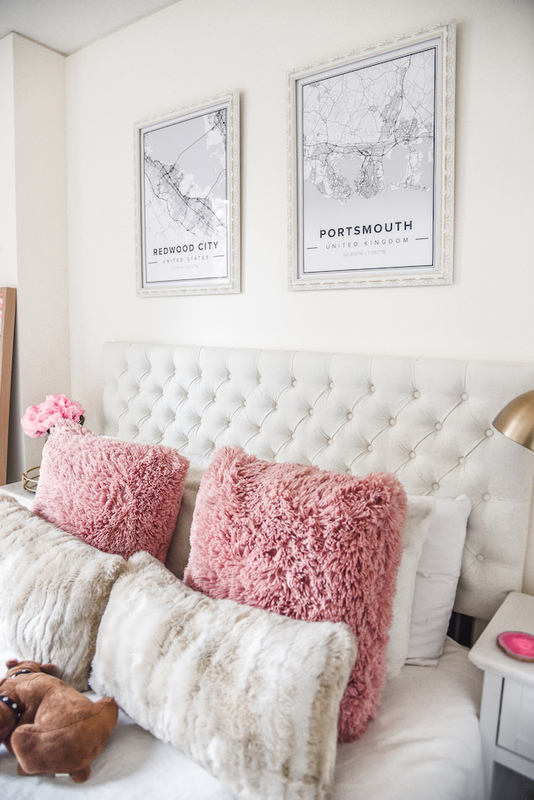 A plain white duvet, a few pops of pink and gold, and a gallery wall with some of my favorite prints. I didn't have a hard time choosing my color scheme because I just chose my three favorite colors, haha! I think a white bedroom also gives more of an 'airy' feeling, and it's very easy to change the style by swapping out pillows. If you've been reading TCB for a while, you may remember most of these decor items from my previous bedroom. Like I said, I haven't changed out too much! I still have the same gold lamp from my years in the dorms, the same faux flowers (which I'm obsessed with! ), the same nightstands, and a few of the same prints in my gallery wall. 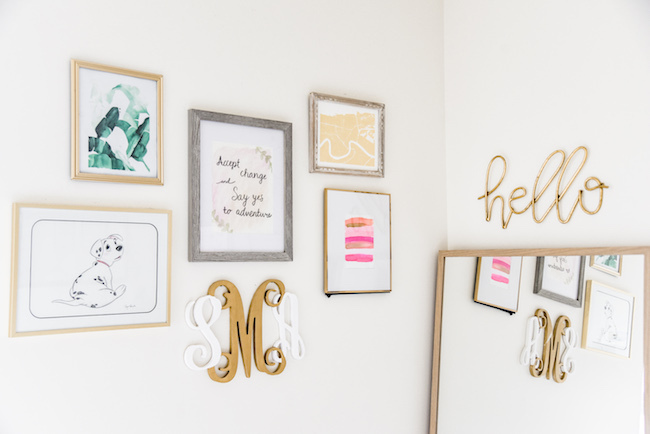 Want to know a secret to saving money for your gallery wall? Make your own art or just print from the internet! I painted the middle quote along with the pink art, and painted my own wooden monogram (I didn't make it myself though). I also printed out the leaves print from a free wallpaper website, and my previous art had been clippings from a magazine! I love supporting artists when they don't provide a free download though. The 101 Dalmatians art was purchased at Disneyland and the gold map is from an artist on Minted. Oh storage, how I love, hate, and need you all at the same time. If you couldn't tell, my bedroom is much smaller than my previous space in Orange County. I'm totally okay with that, but that meant that I needed to get crafty with my storage and find a way to make everything look pretty. I found a wonderful dresser at a discount furniture store that holds a surprising amount of clothes (less closet space here too!) I also had A LOT of books to store as I gave up my bookshelf when moving. That's where the trunks come in! Not only do I store my books in there, but a few other random items as well that I only need every so often. 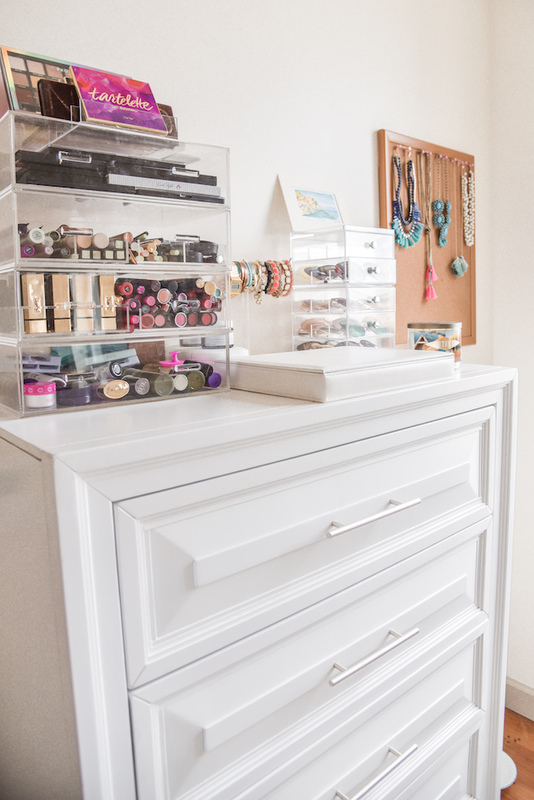 My favorite storage though would have to be my acrylic makeup containers! There's something so satisfying about organizing all my makeup into categories and then making it look nice. Does anyone else feel the same way? These containers from The Container Store were literally perfect for the vision I had in mind and luckily they hold most of my stuff! This is also Henry's bedroom too! Not pictured is his little corner where he gets fed and his favorite scratching post. He's a messy eater so I figured it would be best not to share his space on the blog 😂. 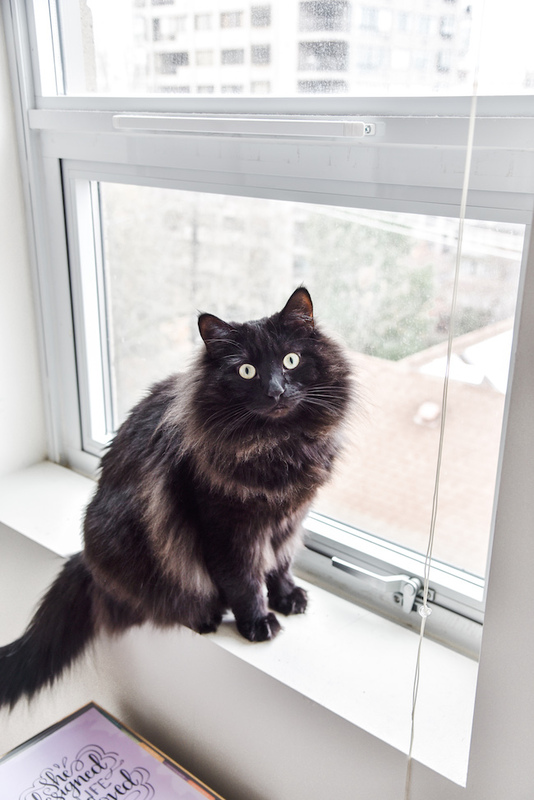 Mostly though he spends his time staring out the window or sleeping on my bed. He's a big cuddler so he also likes to cuddle up with me when I sleep! I'm pretty sure he thinks I actually share his room since he always tries to take up the middle of the bed and spends more time in there than I do. What do you think of my bedroom tour? What's the style of your bedroom? 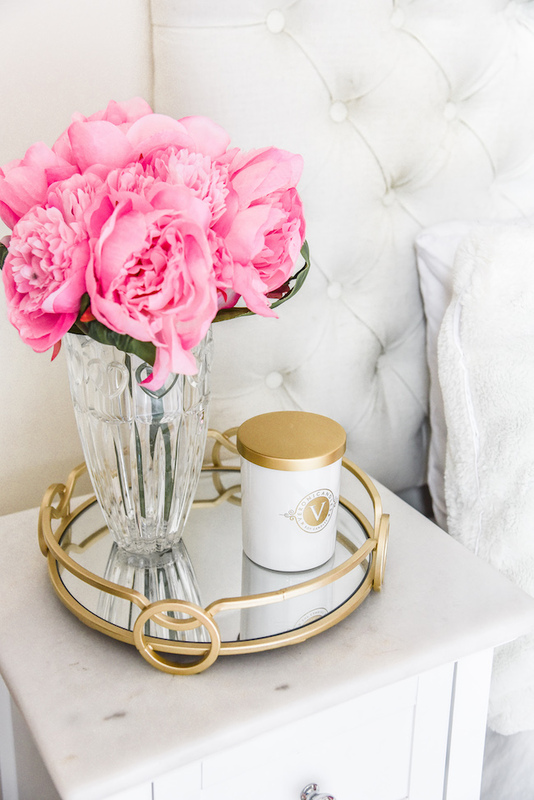 Below you can shop all of the decor from my room! OMG I love your bedroom! Especially the headboard and throw pillows. Everything looks so comfy! I bet you have no problem falling asleep somewhere that serene! Wow you have done such a beautiful job with your bedroom. It looks like such a light, bright and inviting space. omg this apartment is major goals and i am obsessed! Wow I am in love with your room!! It is the cutest! My husband and I will be hopefully moving in the next few years and I can't wait to redecorate! I LOVE your space -- so feminine and perfect! OMG Goalssssss girlfriend! Love it!! Gorgeous! Love the white with pops of color throughout. Looks very comfy and cozy. AHH SO CUTE! I love that you have fluffy!! haha and that your prioritized comfort over aesthetic! I'm like that too! Your room is so pretty and well-decorated! I love your color scheme! Your bedroom is beautiful! I love all the pink and gold! Love the pink and gold touches! Your bedroom looks so chic and comfortable. 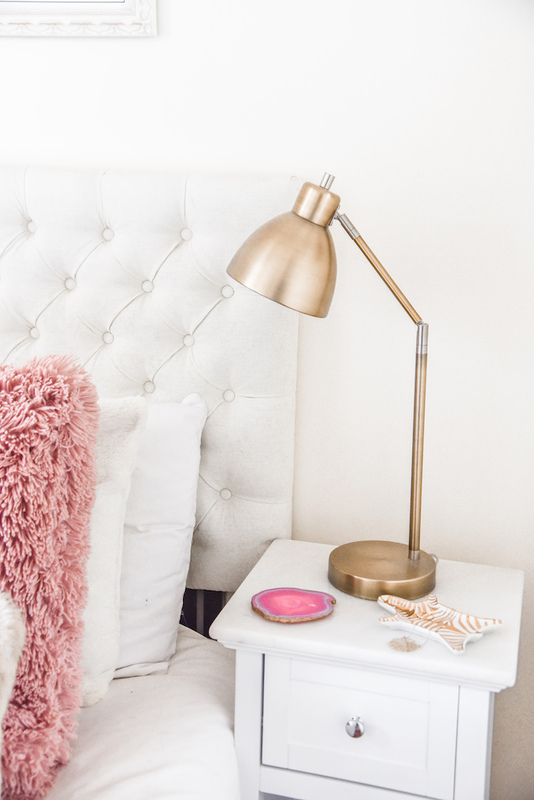 Your room is so cute and girly! I'm married so I can't make my bedroom as girly as I'd like but you best believe my office is super cute haha. You room is major goals babe! Love the color palette and all the natural light. Your Seattle room is beautiful! So airy and right! Can't wait to see your decor in the new place. So bright and airy. I love the colors. What an adorable space! 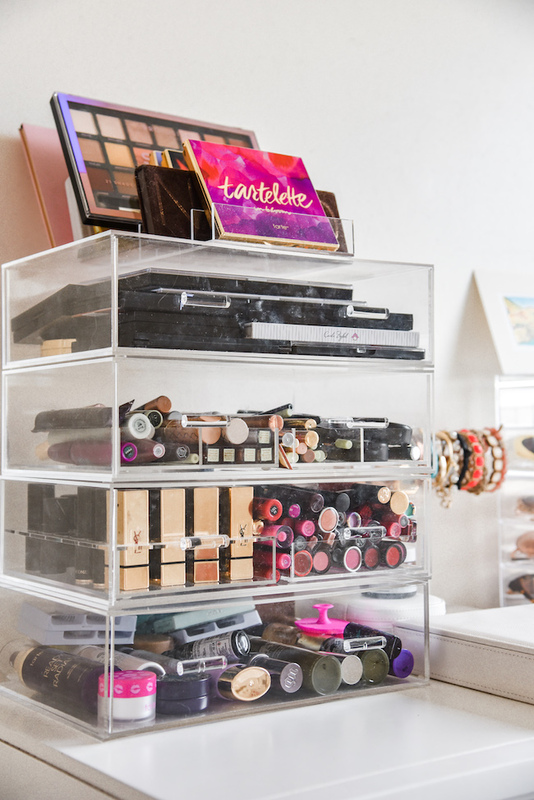 I’m also obsessed with the makeup organization! I totally need to do that at my house. 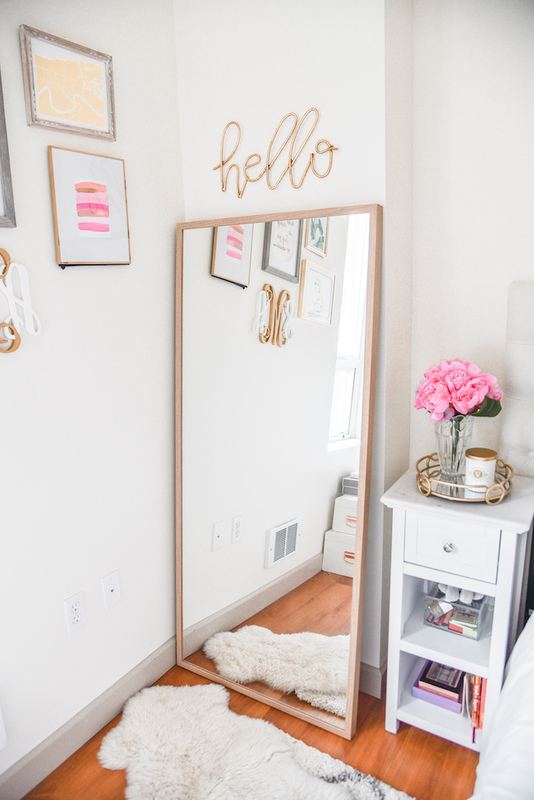 That "hello" sign above your mirror is SO unique and fun! I love the prints above your bed too! Everything looks so pretty! Love it! 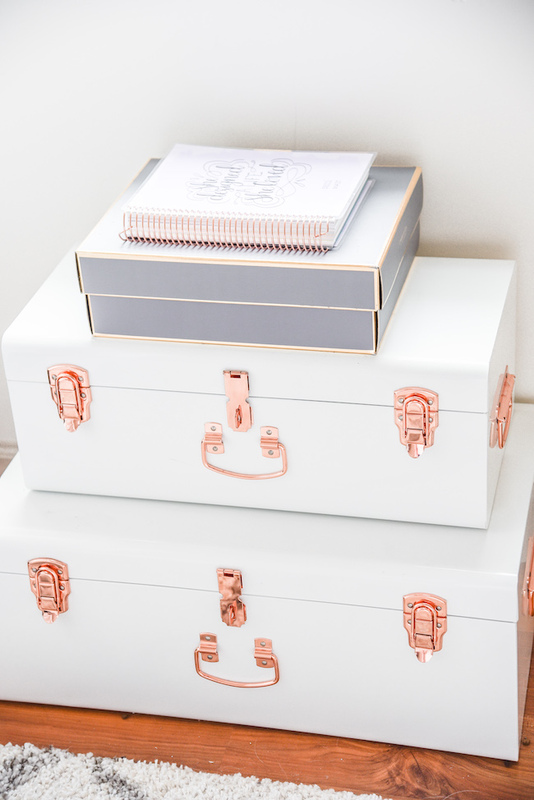 Love what you've done with your space - so pretty! Those pillows look so cozy! Wow this is goals seriously! I love the map prints above your bed. I found a pin with a bunch on gift ideas (it had the above suitcases in it) and it was totally me, even the initial on the necklace lol so I had to come check it out and I'm glad I did! I love this room! Its exactly themed and with the pieces I was looking at (I have similar vintage trunks stashed for when it happens) for what I want to do my daughters room. You did an amazing job!